In the wiki examples I've been developing I've been trying to model names using the TDWG LSID vocabularies, particularly TaxonName. Roger Hyam has obviously put a huge amount of work into developing these, and they handle just about everything I need. However, I think that there's one thing missing, namely a way to express the logical relationship between the parts of a multinomial taxonomic name. For example, consider the fish Chromis circumaurea Pyle, Earle, and Greene, 2008, described by Rich Pyle and colleages (TED have recently posted a great video of Rich talking about discovering new species of fish). Chromis circumaurea is a species in the genus Chromis, and in the TaxonName vocabulary I can represent this relationship using the term "genusPart", which specifies the name of the genus. In a wiki page this could be a link to a page called "Chromis". Only one of these is the fish (Chromis Cuvier, 1814). Cases of the same name being used for different organisms (homonymy) is not uncommon, so linking to strings isn't adequate to express the relationship between the two parts of the name Chromis circumaurea. 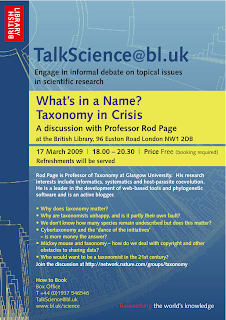 I'd alluded to this issue in my first major foray into RDF and taxonomic names (Taxonomic names, metadata, and the Semantic Web), where I proposed using the Dublin Core term "isPartOf" to link the specific epithet to the genus part. In this case, the link would be between URIs for the names Chromis circumaurea Pyle, Earle, and Greene, 2008 and Chromis Cuvier, 1814. It's a small point, but without some means to link components of a name we're going to struggle to sensibly answer questions such as listing all the species in a given genus (or, perhaps more correctly, all the species names that have been published in a given genus). One way in which researchers assess the trustworthiness of content is by determining how it sits within the scholarly record. Does it provide evidence for its assertions in citations? Do other people cite it? Given how important the NCBI taxonomy is, I think it would be a great improvement if each name could be linked to the original taxonomic publication. A first step to this is to find the taxonomic authority, the name of the author (or authors) of the name. One potential source is uBio, which provides web services for retrieving information on names. Hence, an obvious approach is to map NCBI names to uBio names. However, if I use uBio's SOAP service typically I get multiple records for the same name. Some of these are due to homomyms (e.g., the same name used for a plant and an animal), but many are the same name with variations on the taxonomic authority. Much of this variation arises because uBio aggregates information from a wide range of databases, and each database differs in who it records the taxonomic authority. The nodes in the graph are the taxonomic authorities, "cleaned" by making all the text lower case, and stripping any punctuation. The edges are labelled by the length of the longest common substring shared by the nodes that edge links (I ignore substrings less than four characters long). This graph groups the variations on Diplura Koch (a spider), and Diplura Hollenberg (a brown alga, see doi:10.1111/j.1529-8817.1969.tb02617.x). Not surprisingly, perhaps, the linkouts from the NCBI taxonomy for Diplura are a mess, with the algal genus (taxon:371965 linking to both plant and animal databases, and the insect class (taxon:29997) linking to a mix of plants and animals, not all of the animals are insects. I'm still playing with the underlying code, but I might try and build a web service that returns name clusters (and perhaps the graph as well). 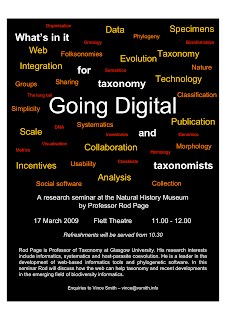 Vince Smith has produced a nice flyer for my forthcoming talk at The Natural History Museum on March 17th (11-12). It will be a busy day as I'm also talking at the British Library in the evening (6pm - 8:30pm), for which Sarah Kemmitt has produced a flyer, and set up a discussion forum on Nature Network. With all this effort going into the artwork, I'd better actually come up with something useful to say. Reading a recent TAXACOM thread (Species Pages - purpose) my sense is that some people are arguing that "species pages" would be time consuming to create, aren't much good for taxonomists (to quote Mike Dallwitz "In brief, to make simplified and attractive information about taxa easily available to casual users? "), and nobody gets credit for making them. In short, "they're not for me, I don't get credit for making them, so why bother?" Others (e.g., Doug Yanega) see species pages -- properly constructed -- to be a research tool. If we extend this to its logical conclusion, we could envisage these pages being the primary source of information on taxa. Indeed, new taxa could be described in this way. In short, "this is the future of taxonomic publication". One obvious way to realise species pages sensu Doug Yanega is using a wiki, but then there are those that horrified by the prospect of just "anyone" being able to edit that content. In short, "wikis are not for serious people, the ignorant might mess up my stuff". Others have had a more positive experience. I realise this doesn't do justice to these positions, but this make things a little concrete, I've put together a demo based on a wiki I'm constructing. The aim of this wiki is to link together taxonomic names, specimens, images, classifications, publications, phylogeny, people in one place. It's a bit like a wiki version of my Elsevier Challenge entry. This is some way off being ready for prime time, but I thought it might be useful to show the sort of thing that can be done. The USNM specimen is linked to a GenBank sequence http://itaxon.org/wikidev/EU358583 . Specimens themselves are linked to Museum collections (using data from Biodiversity Collections Index ). What I hope this crude example demonstrates is a framework where we can support all the kinds of objects we care about, and easily create links between them that can generate useful information. For example, the page for Chromis circumaurea doesn't explicitly list the images shown, they are there because of the links between Chromis circumaurea, the specimens, and the images of those specimens. The same applies to the map. What this means is that very little information needs be entered, it's mostly a matter of joining the dots. Note that these wiki pages already have more information than either iSpecies or EOL. This example has been assembled by hand, but much of the data required can be entered automatically (e.g., for sequences, specimens, publications, etc. ), and tools such as text mining or XML markup (e.g., TaxonX) could be easily exploited. I also realise that as it stands the demo has very limited information about the organism itself, but I don't this this as intractable. If we could build things like this (and I believe we can, with a lot less effort than might be thought), the question becomes this the kind of "species page" that would be useful? This sketches various levels of indirection to go from a label in a tree to a taxon name. 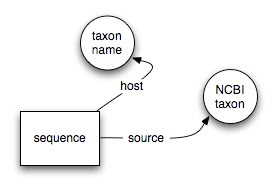 The may be short form of a taxon name (one redirect to name), it may contain a specimen code (redirect to specimen code, then link to name), or it may be GenBank sequence (redirect to accession number, then via source to taxon name with corresponding NCBI taxon id). There are other cases to consider, such as synonyms, but I'll try to deal with these later. 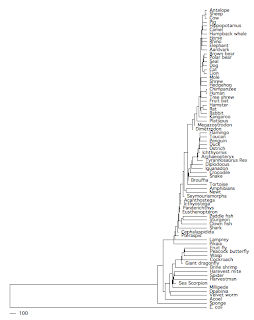 At this stage I'm looking at how to make it simple to query for all phylogenies that contain a given taxon. Having data means we can make inferences that have some basis, other than trying to figure out what a taxonomist "meant". Modelling taxa is a bit trickier. I've sketched my ideas for distinguishing name strings and taxonomic names earlier. That's the easy stuff. What about "taxonomic concepts" and "OTUs"? As a first pass, I'm looking at linking taxon names to classifications via GUIDs. 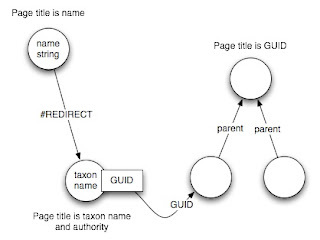 If a taxon appears in a classification then the GUID of the corresponding node in the classification is an attribute of the taxon name, and each classification GUID (representing a node in a classification) corresponds to a page in the Wiki. The trick here is going to be ensuring that I can do sensible queries, such as linking a node in a classification to alternative names. ...many taxon names in TreeBASE are best though of as Operational Taxonomy Units (OTUs) rather than taxonomic names. They identify a set of observations for a particular specimen, set of specimens, or a taxon. For instance, "Eleutherodactylus crassidigitus FMNH257676 Panama" (TaxonID T51971) refers to a 1200 base pair stretch of mitochondrial DNA (AY273113) obtained from Field Museum Natural History specimen FMNH 257676, which has been identified as Eleutherodactylus crassidigitus. [see doi:10.1186/1471-2105-8-158. 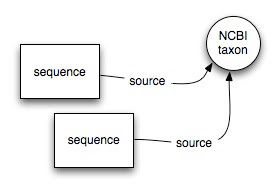 Taxa in phylogenetic trees may be single sequences, multiple sequences (from one or more specimens), or aggregates of information from multiple taxa. The challenge is to model these in the simplest way that reflects this, but also makes queries feasible. What I'm aiming for is for the user to click on a node in a phylogeny, and be taken to a page that best corresponds to the entity in the tree, but at the same time enable queries that will list all phylogenies that contain a given taxon. OK, I've ignored the attributes. 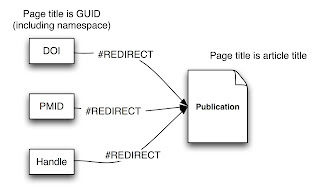 The diagram simply shows the use of MediaWiki REDIRECT to enable the use of standard publication GUIDs as Wiki page names (see earlier posts for more details, and a hack to deal with problem characters in DOIs). One benefit of GUID REDIRECTs is that I can refer to publications using GUIDs, and the wiki user will be taken to the article page without any fuss. Again, GUIDs are REDIRECT pages. This means an article page can have the ISSN of the publication it appears in as one of its attributes, and we can then use ISSNs in our queries. This is one motivation for my work on equivalent author names. 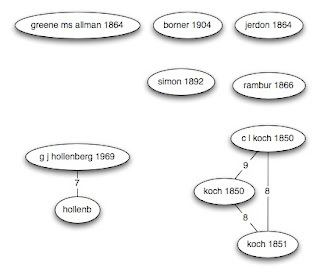 By finding clusters of equivalent names it would be possible to pre-populate the wiki with author names from bibliographic databases, whilst minimising the number of duplicate pages for the same author. There also seems to be some confusion over the license used. The disclaimer states that it is Creative Commons Attribution-Noncommercial 2.5 Generic, but the link is to Attribution-Noncommercial-No Derivative Works 3.0. There's a big difference. The disclaimer encourages us to remix it, the linked license says that we cannot. Here's the NHX tree itself. It's great to see creative people tackling the challenge of displaying the tree of life. I just not convinced that this is the best way to do it.